Why Does Hollywood Keep Casting Chadwick Boseman in Biopics? Chadwick Boseman has been cast as Thurgood Marshall in an upcoming “courtroom thriller” about the first black Supreme Court justice. To date, this marks Boseman’s third time being cast as the lead in a biopic. Additionally, he landed the role of the Black Panther—one of the few black superheroes seen onscreen. He’s a fine actor and all, but I have to ask: Is Chadwick Boseman going to play every famous black man ever? I can’t reasonably fault Boseman for saying yes to all these roles. Rather, as usual, the blame falls on the shoulders of a Hollywood machine that struggles to adequately support and tell the stories of people of color. Boseman did what he could with the role of Jackie Robinson in the solid but lackluster 42, and his performance as James Brown in Get On Up was pretty much the only good thing anyone had to say about the film. But this Thurgood Marshall role feels forced. For starters, Boseman doesn’t bear any particular resemblance to Justice Marshall. It’s not as if the studio was looking for a big celebrity name to push the film, à la Will Smith as Muhammad Ali or Joaquin Phoenix as Johnny Cash. Boseman, while a good, working actor, is not a celebrity are far as the marketing is concerned. His tenuous notoriety only bolsters the argument that hiring another actor would have made just as much sense. Of course, a biopic is not a documentary, but there is some degree of authenticity necessary to make a historical film work. 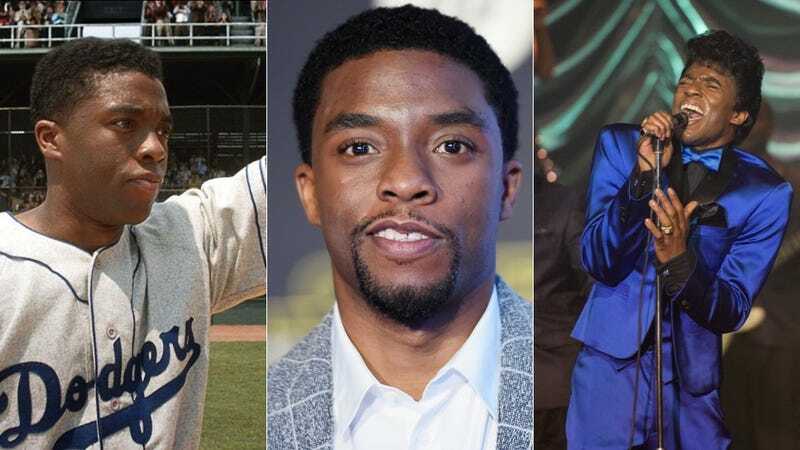 Asking audiences to see Boseman as Jackie Robinson, James Brown and Thurgood Marshall seems like a stretch. This feels like a specifically black problem and it’s hard to see this as anything other than laziness on the part of Hollywood’s casting directors or genuine ignorance about sea of black actors looking for work. My co-worker Bobby pointed out that something similar happened with Angela Bassett in the ’90s. In a three year span, she played Tina Turner, Katherine Jackson—plus Betty Shabazz twice. Bassett also landed the role of Rose Parks in a 2002 made-for-TV movie, the mother of the Notorious B.I.G. in 2009’s Notorious, and in 2009 she played Corretta Scott King in another made-for-TV film. At a certain point you have wonder if whoever is casting these films is even trying or simply going with one of the few black actors they’re familiar with. It’s not that anyone wants Angela Bassett or Chadwick Boseman to get less work, but it would be nice to see the wealth spread out a bit, particularly when another actor might be just as, if not more, suited for the role. Top image via Warner Bros., Jason Merritt/Getty and Universal Pictures. Inset image via AP.